The seminar held on 3-4 October in Geneva by Knowledge Ecology International featured Bernt Hugenholtz, professor of intellectual property law and former director of the Institute for Information Law of the University of Amsterdam. He described “three general weaknesses” in the current draft treaty text [pdf] discussed in the WIPO Standing Committee on Copyright and Related Rights (SCCR): economic, conceptual, and pragmatic. Broadcasting organisations are currently protected under the 1961 Rome Convention for the Protection of Performers, Producers of Phonograms and Broadcasting Organisations. Broadcasters, Hugenholtz said, are asking for additional rights to protect them from signal piracy in the digital age, which was not envisaged in 1961. IP rights do not come naturally with conducting business, and most entrepreneurial activities do not give rise to IP rights, even if the business requires substantial investments, according to Hugenholtz. Since IP rights are an exception to freedom of competition, he said, they “should be well justified economically or otherwise.” The rationale of granting IP rights to broadcasting organisations rely on two conditions, he said. The first is that intangible informational goods are produced that can be reproduced as zero or marginal costs, and the second is that producers of goods have substantially invested in the production of the goods. This is the paradox of IP protection in the digital environment where the ease of piracy and unauthorised uses have vastly increased online, but the technical cost of broadcasting and distribution have dropped dramatically. Broadcasters would argue that the cost of production and purchasing of online content has risen, such as premium coverage of Champion League sports, or expensive TV series, but the argument is “unsound,” he said. Neighbouring rights for broadcasters reward the investment in producing and distributing broadcast signals, not for producing or acquiring audiovisual content as such, which is the domain of copyright, he said. “Granting IP rights for no sound reason can have serious negative consequences both for the economy and society at large,” he said, adding that it could risk impeding the right of expression and access to culture. 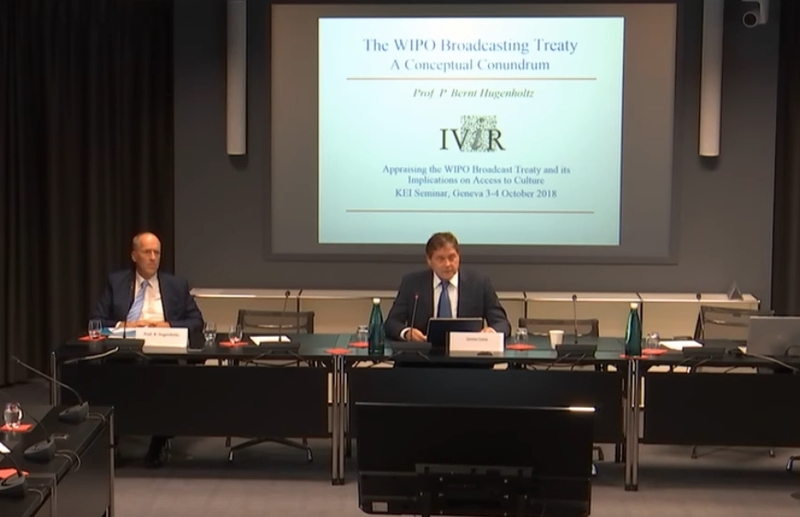 Another issue with the draft treaty text, according to Hugenholtz, is that properly defining what is broadcasting “has proven to be highly problematic.” It is however crucial that it be precisely defined, he said. In the digital environment, broadcasting has become a fluid notion, he said. Traditional broadcasting may become extinct, in many parts of the world, as it is in Norway and soon in Belgium, shortly after a broadcasting treaty is adopted, he said. If computer networks are included, that may give exclusive powerful rights to any intermediary that electronically disseminates audiovisual content, he said, adding that the treaty in that case might be inventing a right that will fall into the hands of companies such as Google, Apple, and Netflix. The choice is thus reduced to between a traditional, old-fashioned definition of broadcasting that might be too narrow, or one that is far too broad, he said. "WIPO Broadcasting Treaty Unfit For Needs, Might Jeopardize Access To Culture, Scholar Says" by Intellectual Property Watch is licensed under a Creative Commons Attribution-NonCommercial-ShareAlike 4.0 International License.